Jenny Nagaoka is deputy director of the University of Chicago Consortium on Chicago School Research (CCSR). Camille A. Farrington is a research associate (assistant professor) at the University of Chicago, School of Social Service Administration (SSA). Melissa Roderick is the Hermon Dunlap Smith Professor at the University of Chicago SSA and a senior director at CCSR. Elaine Allensworth is Lewis-Sebring director of CCSR. Tasha Seneca Keyes is a research assistant at CCSR. David W. Johnson is associate director of post-secondary studies at the University of Chicago SSA and CCSR. Nicole O. Beechum is a research assistant at CCSR. Research has shown that in addition to academic knowledge, a variety of noncognitive skills are essential to students’ post-secondary success. Note: This article is adapted from Farrington et al., Teaching Adolescents to Become Learners. The Role of Noncognitive Factors in Shaping School Performance: A Critical Literature Review (Chicago: CCSR, 2012). Research shows that the economic payoff for having a college degree, versus a high school diploma, is higher than ever (Carnavale, Rose & Cheah 2011). Youth in the United States have an understanding of this new economic dynamic; almost all high school students now say they expect to enroll in college (Engle 2007). However, despite large increases in college enrollment in the past fifteen years, completion rates have barely moved (U.S. Department of Education 2012). For the first time in U.S. history, retirees have greater levels of educational attainment than young adults entering the workforce (OECD 2013). A host of education policies, enacted with the hope of reversing this trend by increasing academic demands, are now being implemented across the country, from raising graduation requirements to increasing participation in advanced coursework. More recently, the Common Core and Next Generation Science Standards are being instituted in states across the country,1 with the expectation that an articulated framework of content knowledge and core academic skills will lead to high school graduates who are better prepared for college and the workforce. These efforts to increase academic demands have largely coalesced around the term college ready. A range of studies have found that noncognitive factors have a direct positive relationship to students’ school performance as well as their future outcomes. Nobel prize-winning economist James Heckman (Heckman & Rubinstein 2001) popularized the term noncognitive and argues that beyond academic knowledge and technical skills, noncognitive factors such as motivation, time management, and self-regulation are critical for later life outcomes, including success in the labor market. While there are decades of research on the myriad factors that have been tied to later academic and job market success, it is difficult for school practitioners to know how all of these factors fit together to affect students’ success. This article summarizes a review by the University of Chicago Consortium on Chicago School Research (CCSR) that brought together hundreds of studies of factors that have been tied to academic success into a coherent framework of noncognitive factors (Farrington et al. 2012). The review paid close attention to identifying which noncognitive factors matter for students’ long-term success, clarifying why and how these factors matter, and determining if these factors are malleable and responsive to context and how they are related to each other. The goal of the literature review was to develop a coherent and evidence-based framework for considering the role of noncognitive factors in increasing student attainment and to identify critical gaps in the knowledge base and in the link between research and practice. Parts of that review are excerpted here. The CCSR review also suggests that post-secondary performance and persistence depends not only on the readiness of the individual student, but also the context of the college and the extent to which there is a fit between a student’s needs and the college environment. This calls for a more expansive understanding of noncognitive factors and college readiness, looking beyond individual-level skills to consider the ways students interact with the educational context within which they are situated, and the effects of these interactions on students’ attitudes, motivation, and performance. Major life transitions like starting college require students to adapt to new experiences and meet changing academic demands. This suggests that efforts to promote educational attainment need to be mindful of not just the cognitive and noncognitive skills that make students “ready for college,” but also college choice and the role colleges play in supporting students in the pursuit of their educational aspirations. The noncognitive framework, depicted in Figure 1, was designed to synthesize the vast array of research literature on a wide range of concepts, clarify their meanings, and reconcile disparities between researchers from different disciplinary backgrounds. Five general categories of noncognitive factors emerged from the review, each of which has been shown to be related to academic performance: academic behaviors, academic perseverance, social skills, learning strategies, and academic mindsets. Academic behaviors are those behaviors commonly associated with being a “good student.” These include regularly attending class, arriving ready to engage in work, participating in class discussions, and studying and completing assignments. Academic behaviors occupy an important place in our consideration of noncognitive factors because virtually all the ingredients that go into students’ academic performance, whether cognitive, noncognitive, or metacognitive, are expressed through their academic behaviors. Academic behaviors such as completing class assignments and participating in classroom activities are how students develop and demonstrate their content knowledge and academic skills. Conversely, if a student thoroughly masters the material in a course but does not turn in assignments, the teacher would be unable to judge what the student knows or is capable of doing. As students begin college, the structures and supports that existed in the high school context to guide them toward positive academic behaviors may not be available, and some students may struggle as a result. Context, as well as students’ access to learning strategies and their mindsets about academic work and the college setting, all play a critical role in whether students display the academic behaviors they need to perform well in college. Academic perseverance refers to a longstanding body of psychological concepts. Broadly, academic perseverance refers to a student’s ability to remain focused and engaged in work despite distractions, setbacks, or obstacles. Academic perseverance addresses student effort and the resulting quality of academic behavior (the intensity and duration of a student’s academic behavior). It can refer to persistence on a particular task or working toward a long-term goal, a concept that has been called “grit” (Duckworth & Seligman 2005). Academic perseverance and its related concepts (e.g., grit, tenacity, self-control, delayed gratification) are defined in a range of ways. Dweck, Walton, and Cohen (2011) use the term academic tenacity to encompass not only whether students work hard or see work through to completion despite obstacles but also the factors that affect perseverance – the mindsets and skills that underlie student persistence.3 Under this expanded definition, academic tenacity includes not only whether or not students persevere, but also the academic mindsets (which encourage or inhibit continuing effort), academic skills (which make it easier or harder to complete tasks), learning strategies (which make students’ efforts more effective), and innate personality traits that shape behaviors.4 The CCSR framework keeps the specific mechanisms that can affect change in students’ academic persistence distinct so that practitioners can more easily understand how to develop more effective interventions and support programs. In the college context, where students are being asked to do more challenging and often unfamiliar tasks, often with less support, academic perseverance becomes particularly important. Thus, both education policy and practice have sought ways to increase students’ academic perseverance to improve academic performance and college readiness. Educators might be tempted to try to increase students’ perseverance by assigning large amounts of homework problems, or assigning particularly challenging tasks that will be difficult to complete. However, such strategies are not supported by research; research suggests that perseverance is a trait that is not directly malleable and depends considerably on context. Instead, educators can increase students’ perseverance by affecting students’ beliefs and mindsets about their academic work (which encourage or inhibit continuing effort), increasing their academic skills (which make it easier or harder to complete tasks), and helping them develop learning strategies (which make their efforts more effective). Academic mindsets and learning strategies are two other categories of noncognitive factors; they are discussed later in this section. Social skills include such interpersonal qualities as cooperation, assertion, responsibility, and empathy. Social skills are acceptable behaviors that improve social interactions, such as those between peers or between student and teacher. While there is evidence of the effect of social skills or behaviors on life and work outcomes, their effect on academic performance is unclear from the literature. Evidence is most clear that poor social skills are associated with negative outcomes. Most studies of social skills come from a broader field of research on social and emotional learning, which blends other noncognitive factors with social skills, making it difficult to assess the effect of enhanced social skills on academic outcomes. Learning strategies are the processes and tactics employed to aid the cognitive work of thinking, remembering, or learning (e.g., mnemonic devices, metacognitive strategies, self-regulation). While much of the research is correlational rather than causal, there is a strong link between the use of learning strategies and academic performance. Effective learning strategies allow students to leverage academic behaviors to engage in learning, which can be particularly important to meet the demands of more individualized learning in the college context. There is also evidence that suggests a strong relationship between learning strategies and perseverant behavior. I belong in this academic community (sense of belonging). My ability and competence grow with my effort (implicit theories of ability). I can succeed at this (self-efficacy). This work has value for me (expectancy-value theory). Sense of belonging involves the perception that one has a rightful place in a given academic setting. Educational theorists have long held that learning is a social activity and that understanding is constructed through interaction with others (Dewey 1958; Vygotsky 1978). Accordingly, students need to feel as though they belong to a community of learners (McMillan & Chavis 1986) and that their academic self is a “true” self (Harvey & Schroder 1963; Oyserman, Bybee & Terry 2006). As students transition to college, finding their place in an academic community can be a particular challenge, particularly for underrepresented minorities. Implicit theories of ability rest on the belief that one’s academic ability can improve with effort, rather than ability being something one is born with. Students who believe they can increase their academic ability by their own effort are more likely to work hard, make the effort to build competence, display academic perseverance, and exhibit behaviors associated with higher academic achievement (Cury et al. 2006; Dweck & Leggett 1988). A closely related line of research draws on attribution theory, exploring whether students attribute success and failure to ability versus effort and how these attributions affect their subsequent reaction to similar tasks (Dweck 1975; Kelley 1973; Weiner 1986; Vispoel & Austin 1995). Self-efficacy relates to beliefs that students have about their abilities to succeed at a given task. Individuals tend to engage in activities in which they feel confident in their ability to complete and to avoid those in which they lack such confidence (Bandura 1986). Students are also more likely to persevere at a given task if they feel efficacious and are more likely to bounce back when faced with adversity (Pajares 1996). Expectancy-value theory involves a student’s sense that the task at hand is interesting and holds value. Value can be variously defined as the importance of doing well on a task (attainment value); gaining enjoyment by doing a task (intrinsic value); or serving a useful purpose or meeting an end goal that is important by completing a task (utility value) (Wigfield & Eccles 2000). When students are interested in a subject or see a connection between academic tasks and their own future goals, they are more likely to exhibit academic and perseverant behaviors that make them likely to succeed in school. The evidence clearly demonstrates that the four academic mindsets each increase students’ academic perseverance and improve academic behaviors, leading to better performance. When students feel a sense of belonging in an academic community, believe that effort will increase ability and competence, believe that success is possible and within their control, and see work as interesting or relevant to their lives, students are much more likely to persist at academic tasks despite setbacks and to exhibit the kinds of academic behaviors that lead to school success. Conversely, when students feel as though they do not belong, are not smart enough, will not be able to succeed, or cannot find relevance in the work at hand, they are much more likely to give up and withdraw from academic work and demonstrate poor academic behaviors. Studies of college departure have also underscored the role of mindsets in whether students become integrated into the social and institutional life of colleges. For minority and first-generation college students, the transition to the college environment may also represent a first encounter with an unfamiliar and sometimes subtly hostile racial climate that may undercut their commitment to obtaining a college degree and their academic behaviors and may even artificially depress their cognitive performance (Steele 1992, 1997; Yeager & Walton 2011). Recent research in social psychology suggests that isolated, relatively short interventions targeting students’ sense of belonging in a college setting can produce significant and lasting effects (Walton & Cohen 2007; Walton & Spencer 2009; Yeager & Walton 2011). This research suggests that the effects of students’ self-perceptions – as well as the underlying perceptions themselves – are largely dependent on context. College readiness is often conceptualized as a set of skills, behaviors, attitudes, and knowledge, both cognitive and noncognitive, possessed by individual students that shape their likelihood of attaining a college degree. Our review of the literature on noncognitive factors suggests that college success rests on a combination of the cognitive and noncognitive factors that students bring from high school to the post-secondary context, as well as the post-secondary context itself. Perseverance and academic behaviors can be thought of as the outcome of college contexts rather than simply personal qualities that students bring with them to college. Academic perseverance and academic behaviors can be improved upon by developing students’ academic mindsets and learning strategies. Academic mindsets strongly influence the degree to which students engage in academic behaviors, persevere at difficult tasks, and employ available learning strategies. Rather than seeing the goal as producing students who are college ready regardless of where they enroll, it is equally important that students are making informed college choices.5 It may be most helpful to think about college readiness as a property of the interactions between students and the college context; students’ likelihood of attaining a degree also depends on the institutional characteristics of the colleges they attend. Students, particularly first-generation college students, may require differing levels of resources and supports to make a successful transition to college. Ultimately, the question is not just how to prepare students but also how to create college contexts that better support academic success. Thus, the responsibility for college readiness rests not just on students and their high schools developing cognitive skills and noncognitive factors, but also in post-secondary institutions being ready to support students in attaining a degree and high schools helping students make informed choices. 1. As of September 2013, the Common Core State Standards are being adopted by forty- five states, the District of Columbia, and four territories. 2. For example, David Conley (2013) lists four areas of college readiness: cognitive strategies, content knowledge, transition knowledge and skills, and learning skills and techniques. The College Readiness Indicator System initiative recognizes three areas of college readiness: academic preparation, academic tenacity, and college knowledge. See Borsato, Nagaoka, and Foley’s article in this issue of VUE for more information. 3. 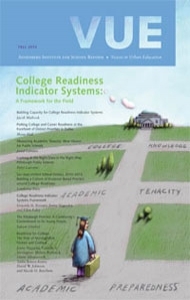 Academic tenacity is one of the three dimensions of college readiness used by the College Readiness Indicator Systems framework described in Borsato, Nagaoka, and Foley’s article in this issue of VUE. 4. While there is strong evidence that these other factors are associated with academic perseverance, the CCSR framework keeps them conceptually distinct from the degree to which one persists in academic work. 5. For a closer look at the college choice process and role of noncognitive factors in the transition to college for urban students, see CCSR’s examination of International Baccalaureate students in Chicago neighborhood schools (Roderick et al. 2009; Coca et al. 2012). Bandura, A. 1986. Social Foundations of Thought and Action: A Social Cognitive Theory. Englewood Cliffs, NJ: Prentice Hall. Carnavale, A. P., S. J. Rose, and B. Cheah. 2011. The College Payoff: Education, Occupations, Lifetime Earnings. Washington, DC: Georgetown University Center on Education and the Workforce. Coca, V., D. W. Johnson, T. Kelley-Kemple, M. Roderick, E. Moeller, N. Williams, and K. Moragne. 2012. Working to My Potential: The Post-secondary Experiences of CPS Students in the International Baccalaureate Diploma Programme. Chicago, IL: University of Chicago Consortium on Chicago School Research. Conley, D. 2013. College and Career Ready and the Common Core: What Everyone Needs to Know. Portland, OR: Educational Policy Improvement Center. Cury, F., A. J. Elliot, D. Da Fonseca, and A. C. Moller. 2006. “The Social-Cognitive Model of Achievement Motivation and the 2×2 Achievement Goal Framework,” Journal of Personality and Social Psychology 90:666–679. Dewey, J. 1958. Experience and Education. New York: Macmillan. Duckworth, A. L., and M. E. P. Seligman. 2005. “Self-discipline Outdoes IQ in Predicting Academic Performance of Adolescents,” Psychological Science 16:939–944. Dweck, C. S. 1975. “The Role of Expectations and Attributions in the Alleviation of Learned Helplessness,” Journal of Personality and Social Psychology 31, no. 4:674–685. Dweck, C. S., and E. L. Leggett. 1988. “A Social-Cognitive Approach to Motivation and Personality,” Psychological Review 95:256–273. Dweck, C., G. M. Walton, and G. L. Cohen. 2011. Academic Tenacity: Mindsets and Skills That Promote Long-Term Learning. White paper prepared for the Gates Foundation. Seattle, WA: Gates Foundation. Engle, J. 2007. “Post-secondary Access and Success for First-Generation College Students,” American Academic 3, no. 1:25–48. AISR’s research, practitioner, and community partners reflect on lessons learned from three years of work on the College Readiness Indicator Systems project to identify students who are off track for college readiness and connect them to supports.